Twin tandem suicide attacks outside Makhachkala, Dagestan’s capital, late on Thursday 05/03/2012, were the deadliest in months, undermining efforts by Russian security forces to contain an Islamist insurgency in the North Caucasus. More than a decade after federal troops toppled an Islamist government in Chechnya, also in the North Caucasus, security forces are fighting militants whose ranks are swollen by anger at poverty, clan feuds and pervasive corruption (see – Ambush 02.19.12). The first suicide bomber detonated a bomb when police stopped a vehicle at the Alyaska -30 trafic station at about 22:20 to check documents, a statement by the National Anti-Terrorist Committee said. The second explosion came when fire brigades and ambulances arrived to the xcene about 20 minutes later, causing additional casualties. Police said the first explosion was equivalent to 30 kg TNT and the second to about 50 kg TNT. Local officials said that in addition to the 13 killed in the blast, seven of whom were policemen, 90 had been taken to hospital and 20 were treated at the scene. Local investigators said they had found the remains of a man and a woman suspected of being the suicide bombers and later identified as Rizvan Aliyev and his sister Mulimata Aliyeva. The attacks fell just three days before Vladimir Putin, who sent troops 12 years ago to crush rebellion in Chechnya, is to be sworn in as president. The unofficial Islamist website www.kavkazcenter.com said the police post was almost completely destroyed. A nearby gas pipeline also was damaged during the attack, RIA news agency reported. Tvoi Den tabloid reported Thursday before the attacks that Rizvan, 23 and his sister Muslimat Aliyev, 19, were suspected to have become suicide bombers after going missing from their home in the regional capital of Makhachkala in March 2012. It said security forces suspected Islamist militants were training the Aliyevs to carry out attacks over the May holidays and published photographs of Rizvan and Muslimat, a dark-haired woman with her hair in a pony tail. Tvoi Den wrote Saturday that another woman was believed to have been driving the second vehicle. It named her as Amanat Kurbanova, 29, a Black Widow of a rebel fighter and published a photo of her in a blue hijab. 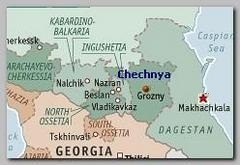 Dagestan faces near daily shootings and bombings blamed on Islamist rebels. It has become the epicenter of violence in the low-level insurgency across the mainly Muslim North Caucasus following two separatist wars in Chechnya.